For almost 50 years, Vintage LeFtOVeRs has been devoted to the restaurants and culture that evolved along the Mid-20th Century American roadside. Chasing collectibles began in the early 1970’s when I shared a meal with my friend, Gary, at Nathan’s Famous Restaurant in Coney Island. Instead of throwing out the paper hot dog wrapper, Gary took his wrapper home—and framed it! 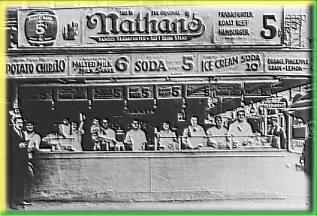 Gary saw the minimalistic design and pop art beauty of the red, green, yellow, and white design advertising, “Nathan’s.” Gary’s vision inspired my appreciation. It ignited my lifelong passion for art, advertising, and architecture of Mid-20th Century America. What began as a hobby of chasing after collectibles turned into a profession. I pursued my passion with private dealers, at auctions, conventions, yard sales, flea markets, swap meets, and eventually created mail order catalogs to sell from. For over 40 years I was part of the vintage collectibles community, as a buyer, seller, and author. An article I wrote in 1984 for “Collector’s Showcase Magazine” featured beautiful photographs Karen Atkinson took of some of my collection. The advent of the Internet, called me to sell with Amazon, as “NRGGRN Books” which I continue to this day, maintaining a 5 star performance record. Finally, the next logical step was creating this website. VintageLeFtOVeRs.com is a loving testament to Gary and the many enthusiasts who inspired me. They were collectors, entrepreneurs, architects, designers, artists, decorators, dealers, and more. It is to these visionaries I dedicate this website, which is both a store and a resource to catalogue the many rarities I collected. It has been a joyful pleasure and privilege to serve each of the wonderful customers we have befriended over the years. Read some of their testimonials here! Whether your passion is for chasing vintage advertising art or seeking new treasures to discover, you will most certainly find something at Vintage Leftovers. We look forward to serving you and the special passion you enjoy chasing after! Receive Vintage LeFtOVeRs’ monthly email to be the first to see new listings, promotions, and other treats. Submit your name and email address here. Your information always remains private, therefore, we never share it with anyone. Every item offered by Vintage LeFtoOVeRs is in excellent condition and sold at an affordable price. Each purchase is guaranteed to satisfy 100%. To ensure our items meet expectations, we therefore maintain uncompromising standards reflecting our commitment to customer satisfaction. We offer super fast, immediate shipping. Shop with confidence from Vintage LeFtOVeRs! Items we sell are, to the best of our ability, described honestly and accurately. Any errors or omissions are not intended to mislead. If we do get it wrong, we will go out of our way to make it right for you. Please take a moment to read our Terms, Conditions and restrictions. • BEFORE MAKING A PURCHASE, please ask questions. There’s plenty of additional information, photographs and scanned images available upon request. • AFTER MAKING A PURCHASE, if you have questions, concerns or are unhappy with an order for any reason, we will make it right! Please call Customer Service or Contact us here via e-mail. • The purpose of all written content on the Vintage LeFtOVeRs website is solely informational. We are not affiliated with any of the companies, corporations, brands, or manufacturers represented by the products, images or information we present. All trademarks, trade names, service marks, logos, and registered brands, represented on this website are the property of their respective owners. Their appearance here is not to be construed as an endorsement of any kind. • You must obtain written permission to use any of the content on this website. • We aren’t perfect and never claim to be. Hence, we appreciate knowing of errors, typos or misidentified items, images, or descriptions. If you can provide better or more accurate information for any item on this site, we invite you to contact us. !!! F A S T & IMMEDIATE SHIPPING* on all orders !! !